Ah yes, the iPad, that achingly cool, underpowered tablet packed full of fabulous music making apps that you’d like to play with all at once. Assuming you have enough power available under the hood then combining synth apps and sound sources, running beats between them and getting things running together is a completely reasonable desire – even my 3rd generation iPad is capable of running a couple of synths at once. Until now to make that happen you needed to use AudioBus which is an app that allows you to route audio from one music making app to another. It works, it’s been awesome but it’s also been around for four years and hasn’t really evolved. So, as the iPad has become more powerful with each generation a space has developed where perhaps a more elegant way of connecting apps together could be found. Kymatica’s AUM is going to have a stab at filling that gap. 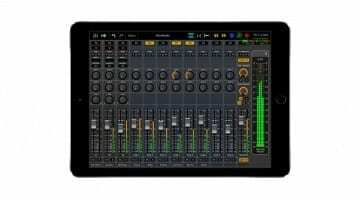 AUM is an audio mixer, a recorder and a connection hub for your iPad, iPhone or iPod touch and what it nails straight off the bat is the layout – it looks like an audio mixer, it has the signal chain that anyone in audio will understand and it all seems pretty intuitive. You choose your sound source at the top. AUM gives you access to every kind of musical input from hardware inputs, which could be the built in mic or an attached audio interface; it could be an internal synth app, drum machine or sampler; it could be a sound file, loop or recording; it could also be an audio unit extension or even the output from AudioBus. The signal then goes through some inserts for processing which can be either some of the built-in effects or any other effects from your iPad. The fader comes into play at this point and can be placed anywhere in the processing chain putting the effects post or pre fader. Then at the bottom you can select your output. By default this is routed to your speaker, but you can choose any hardware output or route to a bus for further processing or back into AudioBus. Each channel or bus can be recorded to audio which is stored directly into the AudioShare file system for easy retrieval. It’s not just about audio – MIDI is also comprehensively catered for. There’s an inbuilt keyboard that can be routed to any loaded synth, either singularly or all together as one big combi patch. There’s a matrix which allows you to route the MIDI from one device to another. You can use their own internal virtual MIDI, physical external MIDI or network MIDI. It all synchronises and can also use Ableton Link to sync beat, phase and tempo to Ableton Live over a wireless network. And then, all the controls are MIDI controllable. On my 3rd gen iPad I can only run a couple of things at the same time and I soon run into DSP problems and crackling audio, but as someone who has struggled with AudioBus I’m finding the comprehensive nature of AUM very refreshing and it’s reignited my interest in using the iPad as a musical device – although I should probably get a newer one. 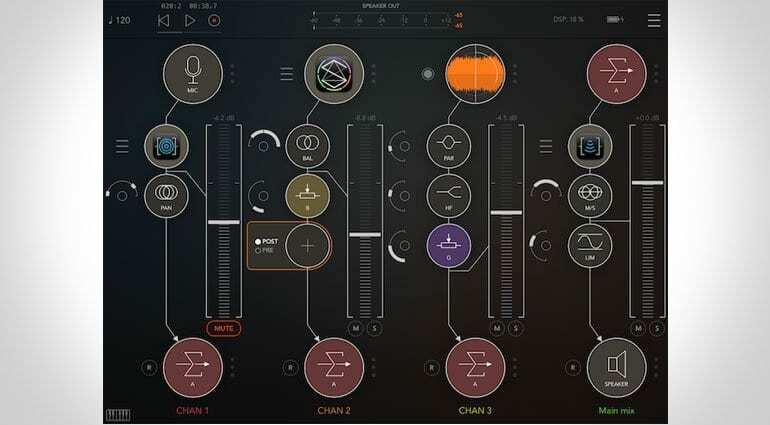 AUM is created by composer and electroacoustic performer Jonathan Liljedahl and he’s written a number of audio orientated apps including the AudioShare filemanager which allows you to easily transfer sound files between apps, devices and online services. Auria 2: the most powerful DAW on iOS?